Hold on to your butts Persona fans, here’s some new information coming your way! Persona 4: Dancing All Night will come in two versions; The “Crazy Value Pack” includes the game and two soundtrack discs, along with an original DLC set. 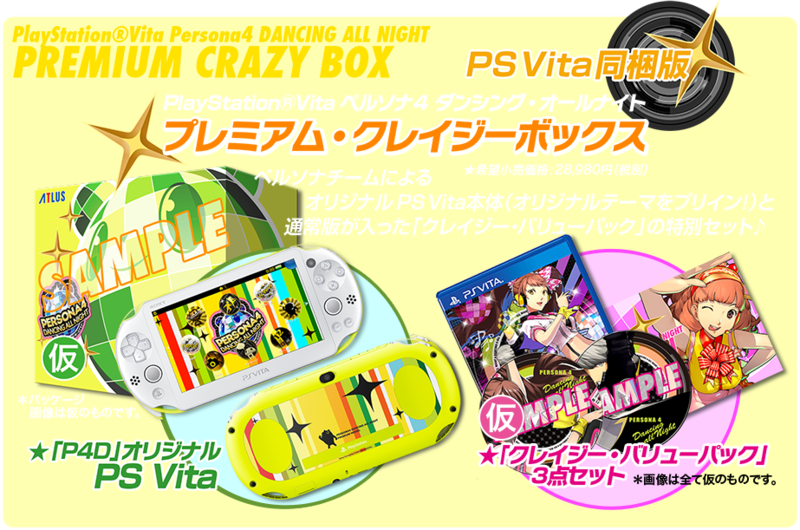 The “Premium Crazy Box” includes everything you get from the Crazy Value Pack as well as a Persona 4: Dancing All Night-themed PlayStation Vita. During the live stream extravaganza, Atlus also announced that first-print copies of Persona 4: Dancing All Night will include a special Blu-ray disc for Persona 5. The blu-ray will include exclusive footage from Persona 5. Persona 4: Dancing All Night will be released in Japan on June 25, 2015 for PlayStation Vita. Is Persona 5 R or Arena on the Horizon?